Contemporary Aesthetics: Crisp, clean lines, with perforated design details on the back, compliemnt current architectural trends across a broad range of applications. Pallet of 6 colors: Six standard colors with special colors available. A finish to compliement any interior environment. Eco-Sensitive: Ecologically responsible, triple strike European chroming prevents scuffing and scratching associated with stacking and heel strikes for a lifetime of good looks. 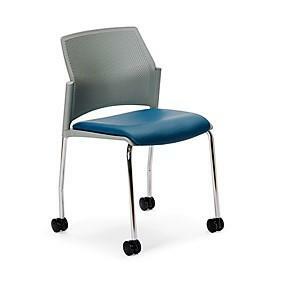 Optional Upholstered Seat: Optional upholstered seat insert can be upholstered in virtually any contract fabric, and enhances comfort while providing an additional design detail. I would like to receive pricing for the following item: Sitmatic Easy Series Chair.